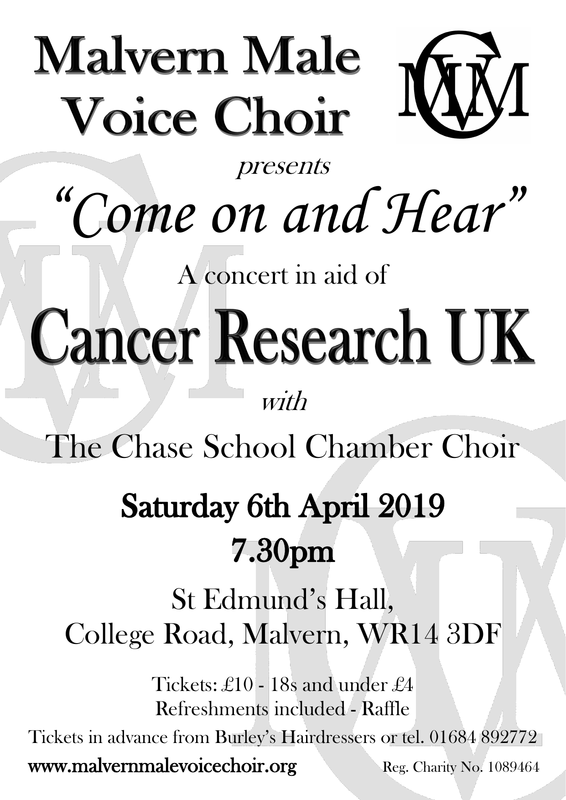 Malvern Male Voice Choir will be holding its popular annual fund-raising concert, jointly organised with The Malvern Committee of Cancer Research UK, on Saturday 6 April, 2019. Entitled “Come on and Hear” it follows a successful “Come and Sing” event earlier in the year. Sharing the stage with the Malvern Male Voice Choir will be The Chase School Chamber Choir whose special contribution will add to a very varied programme of music. The concert starts at 7.30 p.m. and is being staged at St Edmund’s Hall, College Road, Malvern, WR14 3DF. The concert programme will include songs from films and musicals, some classics from the 19th & 20th centuries contrasting with pop hits from later in the 20th century, folks songs and other traditional music from England and Ireland, a couple of American jazz-orientated numbers and other male voice choir favourites. During the interval refreshments will be served and there will be the usual Malvern Committee raffle with multiple attractive prizes. Tickets, which cost £10 (18s & under — £4) and include the interval refreshments, can be bought in advance by telephoning 01684 89772 or can be bought at Burley’s Hairdressers, Worcester Rd, opposite The Unicorn Pub, in Great Malvern town centre; remaining tickets will also be available on the door.